Destroyed in 1930. Saint Thaddeus and Bartholomew Cathedral. 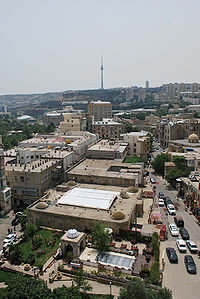 Baku (Azerbaijani: Bakı; Armenian: Բաքու) is the capital city of Azerbaijan. 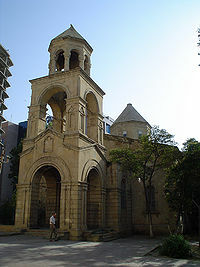 The Armenian church in the centre of Baku is still there. The disputes about this church are continuing. There are various suggestions in this reference. Baku-based newspapers publish articles on destroying the Armenian church. The authors make proposals based on the law on preservation of historical and cultural monuments passed by Mili Mejlis of Azerbaijan that buildings and monuments the mere appearance of which causes pain and sadness should not exist. On the list of these monuments the Armenian church is in the first place. In Zerkalo Shirinzadeh writes: `In the 19th century Baku was not an Azerbaijani city. The number of the natives (the Azerbaijanis), including the inhabitants of the suburbs was barely 40 per cent. The rest were Russians, Armenians, Jews, etc.' Maybe this is the reason why there was not a single Muslim building in the central luxurious part of the city (the so called `old centre') except for the Icheri Shihar Mosque. But there was the protestant church, Alexander Nevsky Cathedral and certainly the Armenian church which is a notable building. Then the author of the article mentions that as a religious institution the Armenian functioned longer (till 1990) than its neighbouring buildings but so far its fate is uncertain. In another issue Zerkalo published the article of the president of the International Academy of Architecture Shamil Fatullayev: `At the beginning of the 20th century Baku lacked a project of the town. In 1903 the Armenian community of Baku bought plots of land and started construction.' It should be noted that the magnificent buildings in the centre of Baku, including the houses of opera and ballet, the former Armenian dramatic theatre, the Armenian school of girls, were built by Armenian businessmen on their own means. Among these are the Dramatic Theatre, the Public Museum, the City Hall of Baku, the Institute of Oil Industry, and another magnificent Armenian church, the St. Mkrtich Church, which was destroyed and on its place the conservatoire was built. 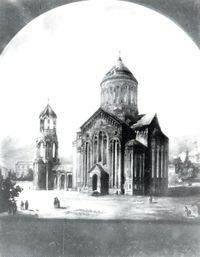 Doctor Davad Akhundov, architect, author of a number of works on architecture, suggests using the Armenian church as a branch of the art museum or as a gallery. He opposes those who suggest changing it into a mosque. `It is unacceptable. There are human rules to respect other religions.' `This will mean desecration,' he says. In another article the commissioner on preservation of architectural monuments of Azerbaijan Fahradin Miraliev agrees to provide the Armenian church to another Christian community or some religious organization which preaches peace and conformity. `There are proposals to change the Armenian church into a mosque. I think there is no need to,' he says. The parishes of the orthodox churches S. Michael Archangel and St. Mary are upset that such a beautiful temple may be given to a sect or by an international bank to use as an office. In the meantime, tourists visiting Baku take pictures of the burnt walls of the Armenian church and the litter at its walls. BAKU (Armenpress)The Azeri culture and tourism ministry is intending to turn Baku's Armenian Church into a library. "I think that turning the Armenian Church in Baku into a library is purposeful," APA news agency cited the minister Abulfaz Garaev as saying. According to Garaev, converting the church into a library would be the right thing to do, as there are not that many Christians in Azerbaijan. Tens of thousands of Azerbaijanis laid red carnations Friday on the tombs of people who died sixteen years ago in two days of clashes with the Soviet Army, some of the most violent events surrounding the breakup of the Soviet Union. After processing through the memorial to the dead, known as Martyrs' Alley, mourners laid the flowers _ which have become a symbol of mourning in Azerbaijan _ on the streets where victims met their deaths trying to prevent Soviet tanks from moving in. Some 134 people were killed and more than 770 wounded. The violent protests came amid ethnic clashes between Azerbaijanis and Armenians and followed a vote in neighboring Armenia to effectively take control of the enclave of Nagorno-Karabakh, which is inside Azerbaijan. Amid spiraling violence, the Soviet government imposed a state of emergency in Baku and deployed some 11,000 troops to crack down on the protesters. "For me, the events of Jan. 20, 1990, symbolize the beginning of the national liberation struggle in the country, when the people's hatred toward the Soviet empire ... expressed itself," said Azer Kasimov, a 40-year-old who joined in mourning ceremonies Friday, which included a moment of silence at noon (0800 GMT). The two Russian channels that normally are broadcast throughout Azerbaijan were shut off for the day and only Azerbaijani and Turkish channels were on the air, aside from satellite TV. BAKU, Azerbaijan--The taxi slows down opposite the Diplomatic Academy, pulls off the main road and along the track behind the rows of garages. The driver takes the taxi sign from the roof and sidles into as inconspicuous a space as he can find. This is one of the back entrances to Baku's Montin cemetery and the main section where the Armenians are buried. The destruction is immediately visible behind the cemetery wall. Gravestones lurch at odd angles, cracked or chopped in half. Looking around to check that there is no one around, we head in, but the building at the gate seems empty. It is only once inside the cemetery that the extent of the destruction becomes clear. We disappear amid the trees among the graves off the path, hopefully out of sight of prying eyes. A decade after the violence between Baku's Azerbaijani and Armenian populations erupted, this quiet corner of the city still bears the scars of the vicious inter-ethnic hatred. Starting right at the entrance, where the Armenian graves begin, the trail of destruction continues remorselessly until you reach the Azerbaijani, Russian, and Jewish sections. The iron fences around family plots remain intact, some still shining with silver paint, but each Armenian grave has been systematically defaced--the headstone pushed over, smashed, defaced with graffiti, the name scored out and the oval photos that were once so beloved in Soviet graveyards prised out. The headstones are old or more modern, plain or elaborate. The inscriptions in Russian or Armenian. The destruction is no respecter of the deceased's status in life and death. A wild, scrawny dog suddenly darts out of a hole underneath a grave. Has someone tried to dig up the grave to humiliate the corpse, or to raid the gold and jewelry the Armenians were said to have been buried with? With an uneasy start, we notice that many more graves have been partially dug out. The air is still and silent as we wander, increasingly numbed, through the unkempt grass in the narrow passageways between each plot, a wary eye still watching the gate to check we are unobserved. An occasional plot remains untouched. A row of three tall black crosses in a well-tended plot stand out amid the destruction. Three Russian names have been hand-written in white paint below the Russian Orthodox crosses. Elsewhere we find another untouched grave, the Latvian name standing out prominently on the head stone. One grave seems to have been newly encased in plain cement. Only one name now adorns the headstone, the name of the Azeri woman who lies below. But was her husband Armenian, perhaps, his name--or body-- removed to preserve her final resting place intact? Time is ticking on. Still numb from the evidence of the destruction, we step back on the path, just then spotting three uniformed policeman striding towards us. Feeling tense in the stomach I turn slightly away >From them to palm my camera into my pocket as we set a determined course for the exit, attempting to ignore them. But they accost us. "This visitor was looking at the Jewish graves here," my friend tells them unconvincingly. The policemen quiz him for a few minutes in rapid conversation, then, reluctantly, they let us go. We dive for the car as unobtrusively as we can. The graves seem now to rest undisturbed, the destruction now a decade old. As we sit in the taxi for the ride back down the hill to the center of town, I picture the mobs traveling up here in a frenzy at the height of the ethnic clashes. They push through the gates and turn on the graves with iron bars, axes, or whatever lay to hand, looking briefly to read the name of the unfortunate who lay below then--if it was an Armenian--setting about the headstone in fury, as if that bore the guilt for the evils that had been unleashed by the Nagorno Karabagh dispute. I shudder, despite the warmth of the day. This page was last edited on 28 February 2019, at 08:48.